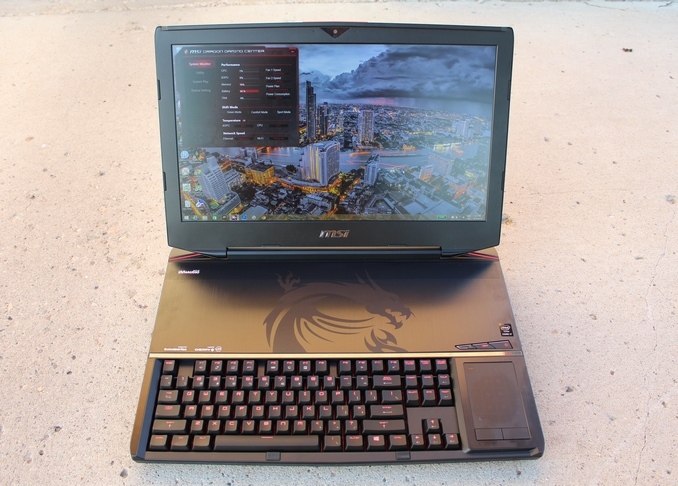 MSI turned to SteelSeries for the keyboard, and wedged one of their Cherry MX Brown keyboards into the GT80 Titan, creating one of the more uniquely designed laptops in quite some time. The keyboard is placed right at the front since a mechanical keyboard requires a lot more vertical depth than traditional notebook keyboards. This poses a slight problem for the standard trackpad placement, so MSI shifted it off to the right side and have made it both a trackpad and number pad. The layout works better than you might suspect, but since this is a desktop replacement, using it with a mouse would likely be the preferred option. What’s behind the keyboard is equally as important, since this is first and foremost a gaming laptop. Here MSI has not disappointed either. Intel has finally released quad-core Broadwell parts, and MSI has shipped us the just recently updated version sporting the Intel Core i7-5700HQ processor. This is one of the new breed of 47 watt processors on 14 nm, with a base of 2.7 GHz and a turbo of 3.5 GHz. MSI pairs this with 16 GB of memory, and not one but two GTX 980M GPUs in SLI. This plentiful processing power pushes polygons to a 1920x1080 pixel panel with proportions past the purview of most portable PCs (and try saying that five times fast). Alliteration aside, the display is right at the upper bounds of a notebook computer, with an 18.4-inch diagonal, making this one of the largest laptops around. It seems like the push for high PPI displays has been slow to come to the larger 17-inch panels, and the even rarer 18.4-inch one like in this device likely means sourcing one is even tougher. This display size at 1080p only results in 120 pixels per inch. At a point we hope that MSI might look into a 4K display at this size, although sourcing 18.4-inch 4K displays might be tricky. The device also does not support NVIDIA’s G-SYNC technology, but at least there should be fewer worries about frame rates dropping under the refresh rate of the panel. There are a couple of different configurations available, with the processor, memory, GPU, and storage options determining price. On the low end, you can get it with SLI GTX 965M GPUs, SLI GTX 970M or just a single GTX 980M card. All of the upper tier models though are SLI GTX 980M. Memory is 16 GB as the base and 24 GB on the top model, but the laptop can support up to 32 GB if you want to add it. Ultimately the versions that end up for sale will be determined by the SIs that decide to stock the device. For our review, we have the Core i7-5700HQ processor, 16 GB of RAM, and GTX 980M SLIs graphics cards. Sweet. No Floptimus = mandatory (try actually playing games for hours on end and you'll start hitting stability issues with Optimus). "Putting that much GPU power for a 1080p screen..."
You do realize that you are not limited to using only the built in screen on the majority of laptops, right? Just verifying, as I know a lot of laptops won't be able to. Then, it's entirely likely you could put that kind of GPU power to use. I would get rid of RAID and just use one single 256GB SSD. Then I'd get rid of SLI and just use one GTX965M GPU. Then I'd drop the screen size down to 15".